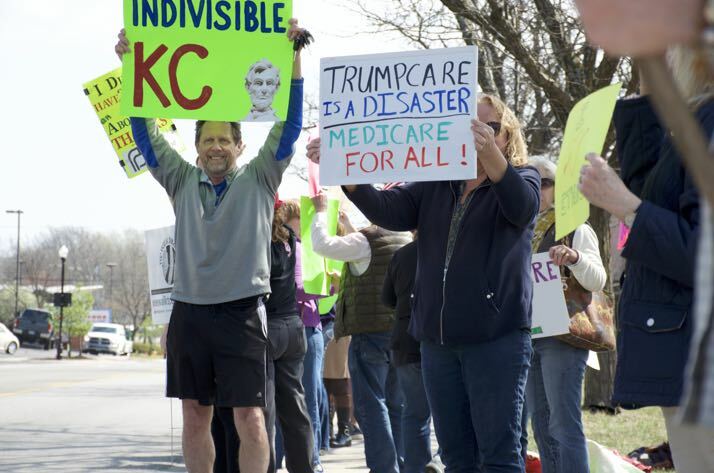 Advocates lined the street Thursday in front of Kevin Yoder’s Overland Park office. The long awaited vote on the Republican healthcare plan will apparently come today, but where 3rd District Congressman Kevin Yoder stands is unclear this morning. Yoder’s spokesman in Washington said the office would have a statement out later today, but did not specify when that would be and did not respond to a request to clarify. A Kansas City Star report in today’s edition said Yoder was still undecided on the bill. The Yoder website gives no information on his position, but it is loaded with references to his opposition to Obamacare. The Congressman’s Overland Park office this morning said all questions had to be referred to the spokesperson in Washington and would not say what constituents are being told when they ask about the bill. Protests outside Yoder’s office in downtown Overland Park have become regular events. Thursday the group Indivisible had organized a protest that included attendees from NEJC. Those attending were writing down their comments to be delivered to the office. UPDATE: Late Friday afternoon – after the vote on the healthcare bill had been called off – we received this statement from Yoder’s office, presumably in response to our inquiry into his position on the bill. “There is no doubt our country is split on how to reform our health care system, but Americans across party lines are depending on us to get this right. While the American Health Care Act failed to achieve majority support, I remain committed to finding a solution. “I’ve met with individuals and groups across the political spectrum. Conservatives have told me they want to get the federal government out of health care, allow states to innovate, and put patients back in control. Progressives have told me they want to retain prohibitions on insurance providers denying coverage based on pre-existing conditions or placing lifetime caps on medical care. As we’ve seen, finding a compromise will be difficult. But I believe it is possible. Next articlePulse of Northeast Johnson County: Should Shawnee Mission keep the Indian mascot for SM North?